The People’s Climate March is only a few weeks away, and conference calls to organize the event are coming thick and fast. In New York City at 11:30 a.m. on Sunday, September 21, tens of thousands of people – projected estimates run as high as 250,000 – will step out in the largest, most diverse climate march in history. I am told that over 850 businesses and labor unions, faith groups, schools and seminaries, and social justice, environmental and civic organizations have been working together to create this historic event. No single celebrity or entity is behind it – this will be a movement made of many movements, a collective call to action. As far as I can tell, it’s an unprecedented collaboration. I missed the 1963 March on Washington, but I don’t intend to miss this one. The purpose of the People’s Climate March? To build momentum for a strong international climate treaty. To stand with front-line communities being hit hard by the impacts of climate change. To show world leaders gathered in New York City at a U.N. climate summit that we’re not willing to settle for more inaction. In short, we hope to create a pivot toward justice and healing. Speaking by phone with a range of religious leaders has generated a lot of creative thinking. People of different faiths will be marching together, and we’re looking for ways to keep our part of the march prayerful and focused. What shall we sing? 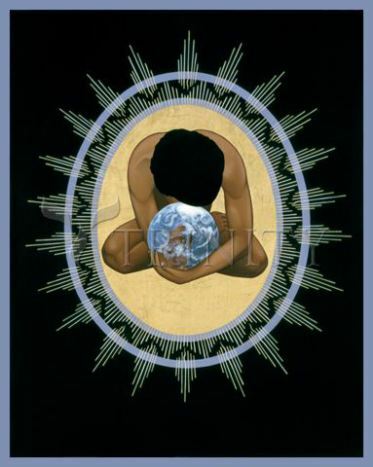 How shall we express our deep conviction that Creation is sacred? How shall we particularly honor indigenous peoples whose religious traditions have always been connected with Earth? How shall we call upon Spirit as we walk together in all our diversity to protect life on this planet? What symbols might we carry? The Ark is an ancient symbol of hope: here is where human beings and the rest of the natural world learn to co-exist in harmony. Here is where we find refuge. Here is where bio-diversity is saved for generations to come. In times like these, when climate emissions are sky-rocketing and political will is flagging, when the draft of a major U.N. report warns of “severe, pervasive, and irreversible impacts” of climate change in the decades ahead, and when you can sit in stunned silence at your computer and watch a Greenland glacier melt before your eyes, it is good to tap into our inner Noah: to discover the self that is willing to rise up in response to God’s call to preserve life on Earth. Channeling your inner Noah does not even require an Ark – sometimes a lobster boat will do. 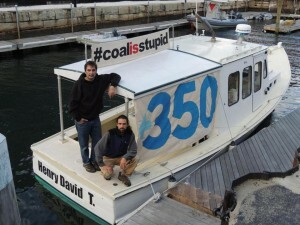 On May 15, 2013, Ken Ward and Jay O’Hara used a little white lobster boat to blockade the delivery of 40,000 tons of West Virginia coal to the Brayton Point Power Station, the largest coal plant in New England. Their action fired up a summer of protests and actions at the Brayton Point plant, and the owners announced last fall that the plant will shut down in 2017. Meanwhile, Ken and Jay are about to stand trial on September 8 and 9 on charges of disturbing the peace, conspiracy, and motorboat violations. If convicted, they face up to nine months in jail. 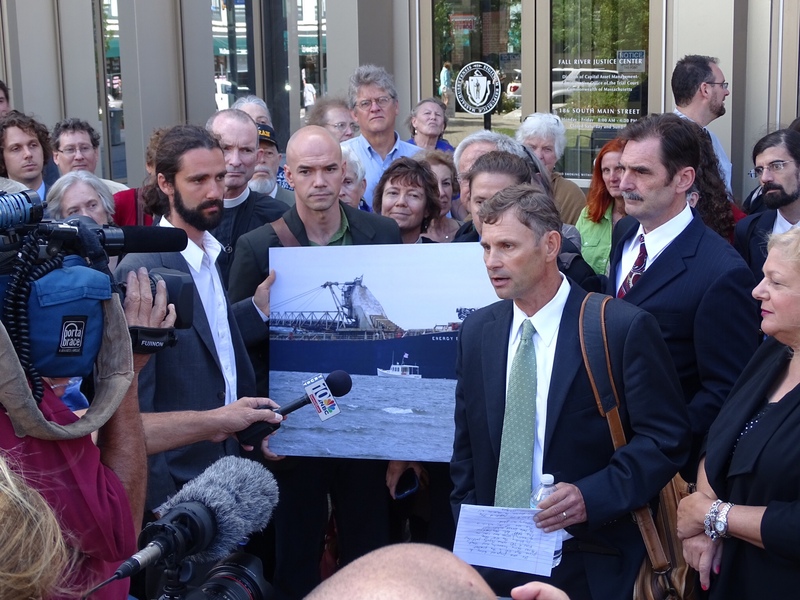 At the Fall River courthouse they will use a groundbreaking legal approach: they will admit to all the charges, but they will bring to the stand expert witnesses such as Bill McKibben and NASA scientist Jim Hansen. Ken and Jay will argue that their actions were necessary to defend their lives from the imminent threat of climate change. 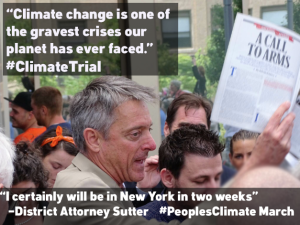 The Boston Globe recently featured an article (fancifully entitled, “The Climate Made Me Do It!”) about this historic case, which would be the first time that a climate necessity defense is used in American court. People of faith will gather at the Fall River courthouse to express their solidarity with these two brave men. Will you join me there on Monday, September 8? For more information and to RSVP, please visit Lobster Boat Blockade. As for joining the Climate March in New York City on September 21, here comes a last call to buy seats on our bus reserved for Episcopalians in western Massachusetts. More than half the seats have already been sold, so please reserve your seat today. The bus will leave Springfield, MA at 6:30 a.m. on Sunday, September 21, stop in New Haven to pick up seminary students at Berkeley Divinity School/Yale Divinity School, and arrive in New York in plenty of time for the march. Holy Communion will be celebrated on the bus, so get ready for your first Eucharist on wheels! The Presiding Bishop is recording a homily for the occasion that will be broadcast on the bus. After the march, everyone is invited to the Cathedral of St. John the Divine for a vibrant interfaith service at 6 p.m. The bus will arrive back in Springfield on Sunday night. The bus trip is being subsidized by the bishops of Province 1 (the Episcopal dioceses of New England), so a round-trip ticket costs only $15, plus a service charge. The Rev. Stephanie M. Johnson, Environmental Missioner for Province 1, will be the celebrant aboard the bus, and I will greet everyone when you arrive in New York. Please bring a church banner. Clergy, please wear a collar. Register for the People’s Climate March here. Reserve a seat on the Episcopal bus and review FAQ here. Request a free pass to the 6 p.m. service at St. John the Divine (which will be crowded) here. Even if you can’t make it to the march, your congregation can support the march in other ways. I know of two Episcopal churches – Church of the Holy Trinity (NY, NY) and Grace Church (Amherst, MA) – whose vestries passed a strong resolution endorsing the March. And congregations everywhere can register to be a Climate March Faith Community. To register as a Climate March Faith Community, go to GreenFaith here, and commit to carrying out four or more of the eight suggested actions. Suggested actions are straightforward: for instance, a congregation can encourage members of the community to join the climate march. It can offer a sermon about climate change, lift up prayers, or invite march participants to report back on their experience. The most unusual suggested action is the last one: at 1:00 p.m. on Sunday, September 21, a congregation can “sound off” outdoors in support of climate action for 5 minutes and 50 seconds. Why 5 minutes 50 seconds? Because that’s 350 seconds. In the global atmosphere, the safe upper limit for carbon dioxide, the chief greenhouse gas that causes global warming, is 350 parts per million. Currently we are close to 400. How do we “sound off”? Churches will ring bells; synagogues will publicly sound a shofar; mosques will offer a public call to prayer; sanghas will ring a meditation gong or bell; Hindu temples will chant a mantra – or your community can carry out an outdoor walking prayer/meditation or design its own outdoor observance. “Sounding off” events will take place at 1 p.m. in a great rolling wave of sound around the world – from Europe and Africa to the U.S. and Asia. The best part of the story of Noah’s Ark comes at the end. God makes a decisive promise to all of creation, human and non-human alike: “I have set my bow in the clouds,” God says (Genesis 9:13). From now on the rainbow will mark “the everlasting covenant between God and every living creature of all flesh that is on the earth” (Genesis 9:16). Looking ahead to the climate march, I hold on to that promise. If there is going to be any kind of flood, let it be a flood of people filling the streets of New York. God has promised to stand with every living creature, and so will we. In the rainbow, see God’s promise…. If you are looking for other ways to get to NYC on Sept. 21 (train, light rail, carpool), stay tuned here, the Pioneer-Valley-focused site for getting to the March. Also, 350MA.org has organized both September 20 and September 21 buses from cities across Massachusetts, including Amherst and Worcester. To order tickets, visit here. Sales end Sept. 10. If you are traveling from Cape Cod, you can find bus seats here. It is a pleasure to be with you on this green, summer morning, and I’d like to thank your rector Peter Elvin for inviting me. I serve the diocese as your Missioner for Creation Care, and today’s Gospel passage provides a wonderful story for us to consider as we reflect on our call to protect the Earth. Most of us have heard the story before – in fact, many times before – and evidently it was a significant story for the early Church: it’s told more often than any other story in the Gospels. A story of Jesus feeding a crowd of thousands shows up in every one of the four Gospels, and the Gospels of Mark and Matthew even tell the story twice (Mark 6:30-44, Mark 8:1-9; Matthew 14:13-21, Matthew 15:32-39; Luke 9:10-17; John 6:1-13)! That’s how important this story was to the first Christian communities. The stories vary in their details, but the basic plot-line is the same: a crowd gathers around Jesus in a deserted place. Jesus teaches them and heals them. Hours pass, evening approaches, and by now everyone is very hungry, but there are only a few scraps of food to be found and no grocery store in sight. The disciples are baffled – maybe even desperate. What can they do? All they have rustled up are five loaves and two fish. Yet when these small offerings are placed in Jesus’ hands, he takes them, blesses and shares them, and behold – everyone eats and is satisfied, with baskets of leftovers to spare. This is a story of hopelessness shifting to hope, of scarcity transformed into abundance, of empty places filled to overflowing. Generations of Christians facing hard times – times of poverty or war, of personal loss or societal breakdown – Christians in times like these have clung to this story, for it assured them, as it assures us still, that even if we feel depleted, tired, or afraid, even if our stomachs are growling or our hearts are yearning, even if we’re sitting in a great crowd of people and feeling anxious, helpless, and alone, there is Someone – capital S, a holy Someone – within us and beside us who will meet us where we are and in whose presence we will be filled with hope and new life, even in the midst of suffering and grief. Now is a very good time to find our selves in this story, for the crisis of climate change is leading many of us to feel as if we’re sitting among those hungry, late-afternoon crowds in the Gospel story, out in the middle of nowhere with night coming on; and the hour is late. Just to say the words “climate change” and most of us tighten up; we duck and draw back; we feel a weight on our chest. The reports from scientists are increasingly urgent and grim, and it’s no wonder, when we allow ourselves to pay attention, that we react with a mix of disbelief, sorrow, and fear. Strictly speaking, most of us are probably not climate skeptics: we believe what the scientists are saying. It’s just that the situation is too much to take in – we can’t deal with it, we don’t know how to respond to it or what we can possibly do about it. How do you respond when you hear from the Intergovernmental Panel on Climate Change, a United Nations group, that climate change is already having far-reaching effects on the world’s continents and oceans? In only two centuries, human beings have pumped so much heat-trapping carbon dioxide into the air that atmospheric levels of CO2 are higher today than they’ve been for millions of years. Recently I heard a climate scientist remark, “We are breathing from an atmosphere that none of our ancestors would recognize.” Burning fossil fuels, such as coal, oil, and gas, at present rates could raise worldwide average temperatures between 5 and 11 degrees Fahrenheit in this century, which would make the world extremely difficult to inhabit. Already our planet is changing before our eyes: oceans are heating up and becoming more acidic as they absorb some of the carbon dioxide released by cars and power plants; tundra is thawing, ice caps are melting, sea levels are rising, coral reefs are dying, massive droughts are spreading in some places and heavy rains are intensifying in others. You know about that – you’ve been through Hurricane Irene. This spring we learned that the huge West Antarctic ice sheet is starting to collapse and slide into the sea in a way that scientists call “unstoppable.” As the environmentalist Bill McKibben has written, “Our old familiar globe is suddenly melting, drying, acidifying, flooding, and burning in ways that no human has ever seen.”1 Given the many pressures on the planet’s web of life, we are now in the midst of Earth’s sixth major extinction event. Maybe half the world’s species could vanish before the century is out. When we hear things like this, most of us freeze. We shut down. We stop listening. We go into shock, into denial, or into despair. We get paralyzed. Either we tell ourselves that it can’t be that bad, surely this is not going to affect me or my children, surely climate scientists are exaggerating and this is just some awful mistake. Or we slide into hopelessness: it’s too late, we tell ourselves; we’re not experts; we don’t have the skills or knowledge or leverage to turn this around; we can’t make a difference; we’re goners; we’re cooked. Either way, like the crowds in the Gospel story, we sit on the grassy hillside as the hours tick by, unable to move, feeling increasingly anxious and empty. And unlike the crowds in the story, we don’t have any nearby villages to which we can go look for food. We’re out here by ourselves, facing an unprecedented historical situation, in which the whole human enterprise on this planet is at stake. Where will we find the inner food, the inner nourishment to meet this crisis with courage and hope? Today’s Gospel story suggests three ways that Jesus’ presence nourishes and empowers the crowds. First, he loves them. He has, as the Gospel says, “compassion” (Matthew 14:14) for them. Jesus knew in his very bones that he was deeply loved by God. He knew that he was cherished to the core, and he came among us to us to show us what we, too, are cherished. We, too, are the children of God. We, too, are beloved. Whenever we know ourselves as precious – whenever we take in the divine love that is streaming through us in every moment, in the gift of this breath and this heartbeat – whenever a person we care about turns and looks at us with eyes of love – whenever we gather together as a community and tell the sacred stories and share the sacred meal that remind us that God is with us – we touch the divine love that will never let us go. Hope comes back to us when we know that we are loved, for whether or not our efforts are successful, we know they are worthwhile – because we are worthwhile, and because God’s Creation is worthwhile. Jesus’ first gift to the crowds is the gift of love. His second gift is empathy. He shares in our suffering, in our brokenness and fear. At the end of the day in our Gospel story, Jesus was just as hungry as the crowds were – just as tired, just as thirsty. Jesus was fully human and he shared fully in the human condition. When it was hot, he sweated. When he was hungry, he needed to eat. Not only that – in this version of the story, Jesus was also feeling an immediate and very personal sorrow. Right before Jesus fed the five thousand, Matthew’s Gospel tells us that Jesus heard the news that his dear friend John the Baptist had been brutally executed. Out of that well of shock and grief, Jesus withdrew in a boat to a deserted place by himself, presumably to grieve and pray. Only then could he come out of prayer to share the Good News. The God we meet in Jesus is a God who shares our grief. I know that many of us can’t even begin to feel the cascade of losses that has already been initiated by climate change. We may be afraid that sorrow will overwhelm us, and that we will drown in the grief. But unfelt emotions can keep us immobilized, so it is good to know that Jesus is with us in our grief, that Jesus shares it and understands it and can give us a heart to hold it without being overcome by pain. It is good to feel our sorrow about climate change, because tears can water the soul. It is good to feel our anger and protest, because anger can be an energy for life. It is good to invite Jesus into our hopelessness, because in that place of emptiness, impasse, and waiting, God’s hope, not ours, can be born. So Jesus offers us, just as he offered the crowds, the gift of his love and the gift of his empathy. He offers a third gift, too: the capacity to act, the power to make a difference. What we have to contribute may seem very small. I mean, come on – all I’ve got here are five loaves and two fish! I’m not a climate scientist or a politician! I’m just an ordinary citizen with a pile of other responsibilities on my plate! What can one person possibly do? But of course there is plenty that we can do. We can recycle more, drive less, and be sparing in our use of water. Maybe we can eat local, organic foods and support our local farms and land trusts. We can install insulation and cut back on AC. As individuals we can and should do everything we can to reduce our use of fossil fuels, but the scope and speed of the climate crisis require action on a much broader scale, too. We need to join with other people and make it politically possible to do what is scientifically necessary. We need to push our political leaders to get this country and other countries on track to bring down the level of carbon dioxide in the atmosphere to 350 parts per million, the uppermost level that many scientists say is safe for life as we know it to continue on this planet. What is the level today? 400 parts per million, and climbing. So we have work to do. Hope arises when we move into action. I like to say that hope is love in action. So if you don’t already have a “green team” or a Creation Care committee (whatever you want to call it) here at St. John’s, I hope you’ll form one and will start to explore what you can accomplish together. I hope that those of you interested in building a network of people in the diocese committed to Creation care will give me your names, so that we can work together and support each other. I hope you’ll read the blog posts on my new Website, Reviving Creation. And I hope that some of you will join me on Sunday, September 21st, when the largest rally in the history of the climate movement will be held in New York City, the People’s Climate March. As Bill McKibben puts it, “If you’re wondering how to react to the devastating news that the Antarctic is melting out of control: New York. If you’re scared like I am by the pictures of the fire and drought across the West: New York. If you’re feeling like it’s time to change the trajectory of this planet: we’ll see you in New York.” The melting ice in West Antarctica may be unstoppable, but so is the love that made us, that sustains us, and that calls us to stand up for life. Jesus is among us now, just as he was among those hungry crowds, offering us here at this table the nourishing gift of his presence and power. There is so much left to save, so much good that we can do, so many ways that we can help to build a better world. I’ll close with the words of Helen Keller: “I am only one, but still I am one. I cannot do everything, but still I can do something. And because I cannot do everything, I will not refuse to do something I can do.” What is Jesus inviting you to do? 1. Bill McKibben, Eaarth: Making a Life on a Tough New Planet, New York: Henry Holt and Company, Times Book, 2010, p. xiii. It’s a pleasure to be with you this morning at Grace-St. Paul’s, and I want to thank your rector for welcoming me back. Some things have changed since the last time I was here. An array of solar panels has shown up on every roof! It’s fantastic! Some things in my own life have changed, too. Last fall I resigned from my job at Grace Church in Amherst, Massachusetts. I went to my bishop and told him that I didn’t want climate activism to be only a part of what I do – I told him that I felt called to focus all my energy on awakening people of faith to the urgency of tackling climate change, and that my dream is to help build a movement to protect life as it has evolved on this planet. Through the grace of God, funding was found, a position was created, and since January I’ve been serving the Diocese of Western Massachusetts as its first Missioner for Creation Care. Now I travel around the diocese like an itinerant 19th century Methodist minister on horseback, or maybe like Paul Revere, spreading the word from church to church that climate change is not only coming, it is upon us, it is here, and that as people blessed and sustained and empowered by God we have the great privilege and holy responsibility to rise up and to do something about it. Take a moment to feel the earth beneath your feet. As you inhale your next breath, take a moment to give thanks for the air that is flowing through your lungs. Notice the living world around you. In awakening to the gift of God’s creation, you are not alone! Today (June 5) is World Environment Day, and people around the world are turning with grateful hearts to oceans, rivers, and trees, to birds, marine animals, and mountains, as we honor our corner of creation and remember how interdependent everything is. The United Nations invites us to celebrate World Environment Day, or WED, a pretty fine acronym evoking the possibility that one day human beings and the rest of creation will be “wed” together in love. That may sound impossibly quaint or far-fetched, given humanity’s collective assault on the natural world, from deforestation and the spread of toxic chemicals to species extinction and climate change. But it’s a vision that speaks to my heart. To play with the marriage imagery, I’d say that humanity and the rest of creation could definitely use some marital counseling. So today is a good day to refresh our personal relationship with the natural world. We can ask ourselves: What kind of relationship am I creating with the living world around me? Do I hurtle through the day with my head down, absorbed in my own thoughts, wired for worry and ignoring my non-human kin? Or do I make myself available for encounter? Do I notice the hawk overhead, the shining leaf and passing cloud? Do I give myself permission to slow down and pay attention, to relish each breath and to bless the ground with every step? Is there something I can do this week to express my affection for the web of life of which I am a part, and my concern for its well-being? Love every leaf. So says Father Zossima, the Russian Orthodox abbot in The Brothers Karamazov, a novel that I read in high school, studied in college, and studied yet again while completing my doctorate in Russian and comparative literature. From his deathbed, the abbot describes the ecstatic perception of reality that inspired his life. Love all God’s creation, the whole and every grain of sand in it. Love every leaf, every ray of God’s light. Love the animals, love the plants, love everything. If you love everything, you will perceive the divine mystery in things. Once you perceive it, you will begin to comprehend it better every day. And you will come at last to love the whole world with an all-embracing love. A version of that passage is taped to the back of every “Compassion Mandala” icon made by Robert Lentz, a wonderful image for meditation and prayer. The image shows a Christ-figure surrounded by golden light, bending over to embrace the Earth. Without a word, the image portrays the all-embracing compassion of Christ, whose love extends not just to each of us as individuals, and not just to human beings, but also to the whole creation. I imagine a crowd of Christians from across New England, the Atlantic seaboard, and beyond, gathered on that September weekend in New York, along with thousands upon thousands of other people. I imagine us walking, singing and carrying banners from our respective churches. I imagine us witnessing to a creative and redeeming God who loves the world with an all-embracing love and whose Spirit empowers us to tackle the biggest challenge that human beings have ever faced. Find a way to come! I’ll see you there. 1. Fyodor Dostoevsky, The Brothers Karamazov, translated by Constance Garnett, revised and edited by Ralph E. Matlaw, New York: W. W. Norton & Company, 1976, p. 298. It is a pleasure to be with you on this Memorial Day weekend, and I’d like to thank your rector for inviting me to preach. As your Missioner for Creation Care, I am especially glad that today is Rogation Sunday. Celebrating rogation days is a custom that goes all the way back to the 5th century. The word “rogation” comes from the Latin verb rogare, which means “to ask” and also gives us the root of our English word, “interrogate.” Rogation Sunday, the Sixth Sunday of Easter, is all about asking: we ask God to bless the land and to give us a fruitful harvest.